I took a long break from posting about The Kerrigan method of ‘Writing to the Point’, but now I plan to get back on track to complete the series. WTTP is a “highly structured” approach to writing instruction. Here’s what I wrote in my first post on this topic back in November of 2011. I’ve long admired the writing technique espoused by William Kerrigan in Writing to the Point (WTTP). His simple, multi-step process is so appealing as an instructional method, especially for struggling students…. … the Kerrigan method is unusual only in its approach and style, not in its content. What it teaches is what anyone would want in expository writing: unity, coherence, detail. A recap of the WTTP Steps 1 through 4. After finally completing lessons on all six steps of Kerrigan’s WTTP method, I remain impressed with the “clarity and efficiency” of his system. While it imposes a rigid structure on learning to write a basic essay, it also establishes the foundation for moving on to more sophisticated compositions. I believe most students would benefit from mastering the WTTP method, or something similar, as a primary step in developing college-level writing skills. And after observing so many approaches used and so much time wasted in our public schools’ writing curriculum, I especially value the efficiency gained by the WTTP approach of “systematically moving through a hierarchy of skills”. My next post on the Kerrigan method will be about reviewing and correcting the first draft of an essay. “Academic writing is formulaic“, according to one SAT tutor who has written a number of books on the topic. It would seem to follow that creative writing should not be an important focus of high school curriculum. Students should master the “formula” before they spend too much time on poetry, journaling, or similar exercises in creative writing. … one of the things I try to get kids away from in terms of their academic writing is the idea that everything they write has to be wildly new and creative. Academic writing is formulaic. It just is. Clarity trumps pretty much everything. You can be creative when you’ve mastered all the rules, but until they, you need to pay attention to what people with more experience do and learn from them. (I think part of the problem is all the hysteria over plagiarism: of COURSE kids shouldn’t be stealing other people’s work, but they also need models! How else are they supposed to learn to write?) When they try to be creative, they write jumbled sentences and the like — it’s just a disaster. When it comes to writing, most students need to learn the rules before they can break the rules. Students are not being taught academic writing in high school. In his “third column on the teaching of writing in colleges and universities“, Stanley Fish addressed a question from readers. Isn’t the mastery of forms something that should be taught in high school or earlier? By all the evidence, high schools and middle schools are not teaching writing skills in an effective way, if they are teaching them at all…. High schools should try something different. 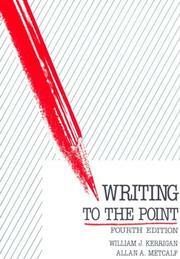 I think K-12 schools would see greater success if they used something like the Kerrigan method of ‘Writing to the Point’, a methodical and efficient approach to writing instruction. I would love to see a separate composition course in high school, employing a basic method like that of Kerrigan, and involving plenty of practice writing. I suspect a course like this would work well as an online option. It worked at New Dorp High School in New York City, where it was found”that returning to fundamentals like explicit grammar instruction and formulaic writing has succeeded in turning around the dismal performance of high poverty students”.